October has been nice driving weather, not too rainy at all. Nights are getting close to freezing, so it's time to hang up the keys for the next few months. 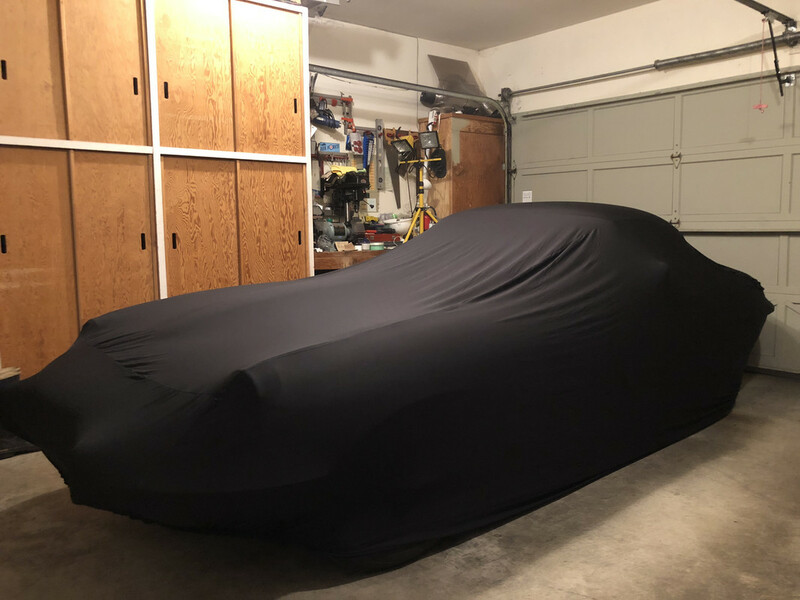 The big cat is bedded down for the winter sleep, having done exactly what it was supposed to do for the old man's bucket list, enjoying every mile .. Originally, I was going to do the next idea on the list over this winter and move this one on to the next lucky custodian, but I think I'll play with what has turned out to be a great pet for one more summer, health permitting. But it doesn't hurt to plan, does it … "And Miles to go before I sleep.. miles to go before I sleep"
I should include the Heritage Trust certificate for the car. No surprises, (which is not a surprise) matching Numbers and I see that the interior was originally Cinnamon, which is the replacement pattern decided on. So, Only the paint is changed.. oh and the 3x1 SU's.. and the 3.07 diff.. however..
All the original parts reconfigured are pulled together in nice blue poly shipping boxes for the next owner, as well as a the new soft-top, which I took off when the hardtop showed up as discussed in the thread. The S3 Grill Surround Mouldings. did you add these, or were they on the car when you got it? To my knowledge, they were never originally fitted to an S2 car, even the cars made in the last days of the S2 production. They are original to the car. I think it may have been specific to North America for the last few. Mine was 480 +/- from the very end of the SII run. It had every change included for the model. I took it to the big Vancouver British car show at Van Dusen, and it got parked beside one of the earliest SIII's. Interesting to look at the style cues of the last SII's in detail. I don't think the surround on the SIII would fit on the SII even if you wanted it. I don't think the surround on the SIII would fit on the SII even if you wanted it. It would. The Bonnet Centre Section of an S2 and S3 are the same, except for two small right angle brackets spot welded to the mouth of the S3 bonnet for the purpose of mounting the Grille. The shape of the mouth formed by the Lower Valance are the same for the two models. The Lower Valance and Mud Guards are interchangeable between the two models (not that one would want to do so). I've not seen any reference to S3 Grille Surround Mouldings being fitted to S2 cars as original in any History, or Originality reference of the E Type. 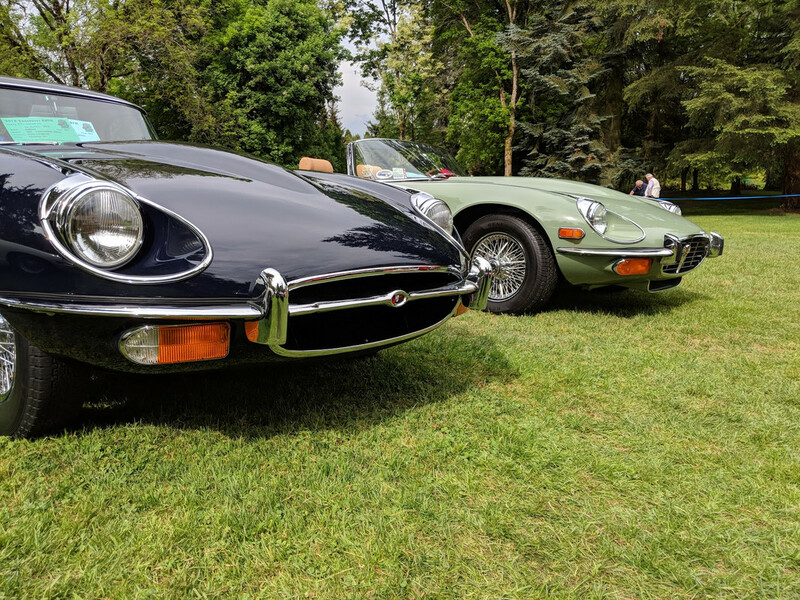 Here's a picture of the two cars side by side at the Vancouver show, of my very late SII build and an early SIII, both registered as 1971 cars. The Opening looks rounder, as in not as elliptical as mine. We had several conversations about that very item with those who should be in the know at the show (at least compared to me) who said that the very last SII's did in fact show up in California with the chrome surround. As far back as the providence for the car goes, they were always on it. Regardless, I do like the trim accent with the dark blue. The Opening looks rounder, as in not as elliptical as mine. We had several conversations about that very item with those who should be in the know at the show (at least compared to me) who said that the very last SII's did in fact show up in California with the chrome surround. As far back as the providence for the car goes, they were always on it. Regardless, I do like the trim accent with the dark blue. I'm not disputing the look; I also like the look. It's difficult to compare two vehicles unless you know the repairs that may have been carried out. But comparing a pristine S2 and S3 bonnet, the opening is the same shape. Notwithstanding that the S3 has flared wheel arches and a Chin Scoop in the Lower Valence, but in terms of assembly, all components making up the whole bonnet, excluding the air ducts and baffles, can be mixed and matched. Jaguar was seldom, if ever, known for making single purpose parts for subsequent models that weren't interchangeable. I doubt that the Grill Surround Mouldings were played forward from S2 production, but more likely that the Mouldings seen fitted to S2 cars came from S3 production and I've seen no record of S2 cars being fitted with these Grille Surround Mouldings in the factory. An acquaintance had a late S2. It also had the chrome trimmed hooter. Alas it is no more as it came to grief on the A36 entering Salisbury when it slid under the trailer of an artic whose driver decided to do a uey. Interesting. In a similar vein, on 'who knew what they were doing at the end of the run', the car on the other side of mine was a 1970 certified European unmodified "survivor" which was also a point for comparison. As discussed earlier in this thread, I had been looking at getting a couple of notch free ribbed cam covers to "match" what would have come out of the factory with the European triple SU's and no manifold carb heat crossover duct. So I was happy to have a chance to look at the international survivor as to what would be period correct. On opening the bonnet, the ribbed cam covers stared back..... One was ribbed with a notch, and the other was notch free. I doubt that that was recorded anywhere, and even more interesting, was how in heck would anyone figure out how to judge to that level as correct/ incorrect. One was ribbed with a notch, and the other was notch free. I doubt that that was recorded anywhere, and even more interesting, was how in heck would anyone figure out how to judge to that level as correct/ incorrect. It has been mentioned many times that E Types were cobbled together out of whatever parts were available and no two are the same. I'm in the camp of Jaguar being far more professional than that and production planning around such a scheme would be a nightmare moving forward (parts replacement on such individual cars down the track etc). However, I've had 6, definitely Australian delivered S3 cars (RHD) through my workshop, that were fitted with LHD windscreen wipers (wiper arms park on the LH side of the car and not a complete wipe of the RH side of the windscreen). Who knows why, or how that came about. I very much doubt that the cars were ordered to be built that way and it may have just been the case that RH wipers arms were out of stock; who knows. Something like fitting incorrect wiper blades, or cam covers, no concerted effort is required. Fitting S3 Grille Surround Mouldings could hardly occur by chance, or mistake. Either the cars were ordered that way, or they were fitted after sale; personally, I think the latter. I've seen a few E Types with Leapers fitted as bonnet ornaments. I doubt that these were fitted in the factory. …. Fitting S3 Grille Surround Mouldings could hardly occur by chance, or mistake. Either the cars were ordered that way, or they were fitted after sale; personally, I think the latter. I've seen a few E Types with Leapers fitted as bonnet ornaments. I doubt that these were fitted in the factory. Agreed, I don't think it was a mistake. Back then, like now, we looked for ways to personalize the cars with some modicum of taste. Some of us did COPO versions for the American muscle stuff, others did flat black accents across the rear and hood. I suppose in the case of the Jags, the thing to consider was the latest chrome surround that adorned the new V12's, or was about to. I've only seen the chrome surrounds on the very late SII's from California. Given the preference of the well heeled Beach Boy car crowd there, it was fairly common to consider such cues. Whether Jag felt that the California bound Cars at the end of the Series II run needed all the new styling help they could muster for little cost to get rid of the last of the inventory run, or whether the Cali dealers just wanted to differentiate them from the 1970 version doesn't much matter to me, at least. But they were out there, and I remember seeing them with the same chrome surround, since I was heavily into the car crazy world at the time, and followed it religiously like many 20 somethings did. I also remember when I was overseas in the military from 1969 to 1972 that the European E Types didn't have the surround. And just to reinforce the chrome nose surround, check this out: Another August 70 car from Texas, licensed as a '71 also pretty much the sister of mine, similar mileage. Watch when they roll it off the trailer. Follow up on the previous post: Looks like the Texas car was built 10 units later than mine: It is 2R14424, mine is 2R14414. It also had the Leapers ( on the near side, but pulled off in the video, but on in XKE Data) as well as the chrome nose. Not sure that the case Bill makes that it wasn't done on the assembly floor can be entirely certain. Interesting. If more can be found in the last 500 built ( mine was 485 +/- from the end), it will help decipher the case..
<EDIT:> Found more after my build, that ALL have the Leaper and the Chrome ring... 2R14425, 2R14464 in just a few minutes.. One was in Hawaii. I believe that some 1000 2R cars were produced and all had the side wing mounted Leaper badges you refer to, fitted. The Leapers I referred to are Leapers à la MK2, MK10 and many others. Mine is a May 70 XKE S2 build and had the bonnet leapers & the chrome nose ring. I see yours was originally shipped to NY like mine. So that would suggest that at the very least, they were shipping the cars to North America with the extra trimmings in 1970. I wonder how much earlier than yours did they decide to do that? Anyone here have an earlier date than 14 May 70? Was it an option or did all the NA cars get fitted? <EDIT> I see that Bill says that about 1000 were shipped like that.. and it was for the 2R's. Congratulations on a stunning restoration! I would appreciate you advising me on the Kangol seat belts, have you restored the original set using blue belts or fitted new units? Please also let me know the formula and make of the dark blue paint used on the E Type. For your information, my Series Two Roadster ( 2R 13821) also has the chrome surround in the bonnet opening. 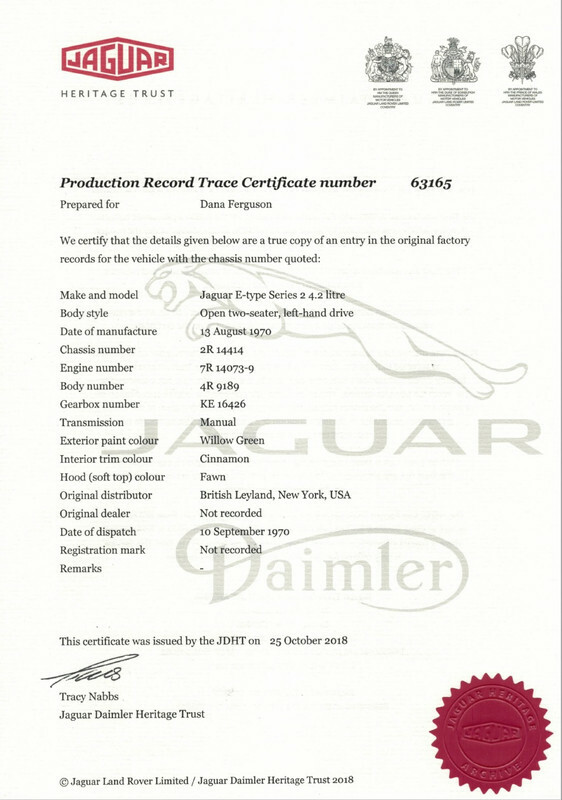 The Heritage Certificate shows build date as 20 May 1970, dispatch date 14 September 1970 to Jaguar Leyland New York. Ask for Jason, and he will know the job as the "Honest Jag". He knows me well. They are very good at what they do, as you can see. I did restore the originals by swapping out the green belts for New Blue ones. It's a simple swap to do. 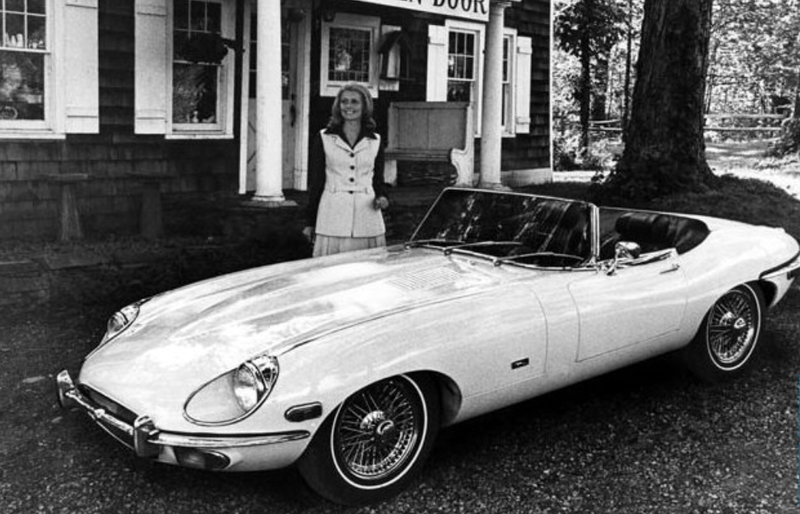 ...dispatch date 14 September 1970 to Jaguar Leyland New York. my S2 OTS P2R14186 was shipped on the same 14 September! I believe the HC states a mfg date in April, I’d have to doublecheck that. Mine has all the 2R insignia. The so called 1971 Model had the chrome surround, the leapers, and they had the emmissions control stuff. Here a period Jaguar press photo for the US 1971 Model, showing the chrome surround. They also had the sidelights. What I haven‘t found out yet is if the 2R cars had the factory shift knob in walnut or the black round ball. and they had the emmissions control stuff. Here a period Jaguar press photo for the US 1971 Model, showing the chrome surround. They also had the sidelights. What I haven‘t found out yet is if the 2R cars had the factory shift knob in walnut or the black round ball. Mine had the black ball.. and still has it. What was the emission stuff besides the strombergs, carb preheat crossover and the charcoal venting canister from the gas tank?